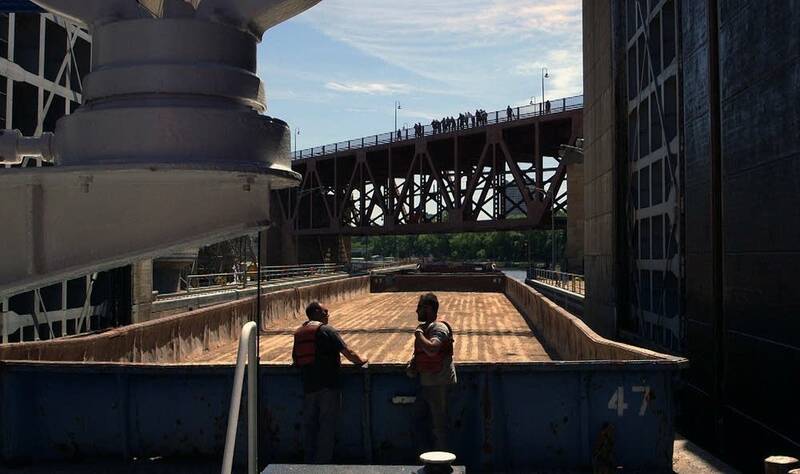 Rising more than 50 feet from the foot of its namesake, the Upper St. Anthony Falls Lock and Dam opened to fanfare on Sept. 21, 1963, when the towboat Savage pushed a barge of cast-iron pipe upstream. Almost 52 years later, on Tuesday night, the Upper St. Anthony Falls lock will run its final cycle. A single line in the Water Resources Reform and Development Act of 2014, an $8.2 billion water infrastructure plan, prompted the closing, ending Minneapolis' reign as head of navigation on the Mississippi River. The fish have been slowly and steadily making their way up the Mississippi since the 1970s, but haven't made it past Minneapolis. "The nice thing about the St. Anthony Falls area is that it has historically been a natural barrier. 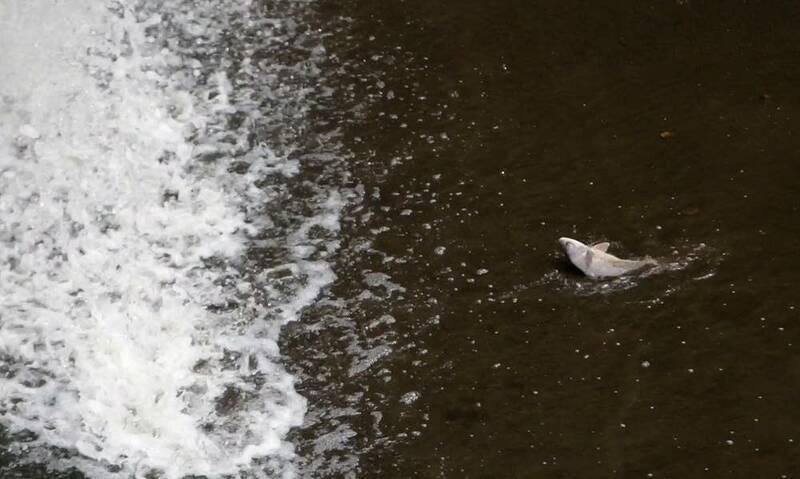 There was a falls located there that fish could not get above," said Nick Frohnauer, invasive fish coordinator for the Minnesota Department of Natural Resources. This week marks the first time a navigable waterway has been closed to stem the tide of an invasive species. 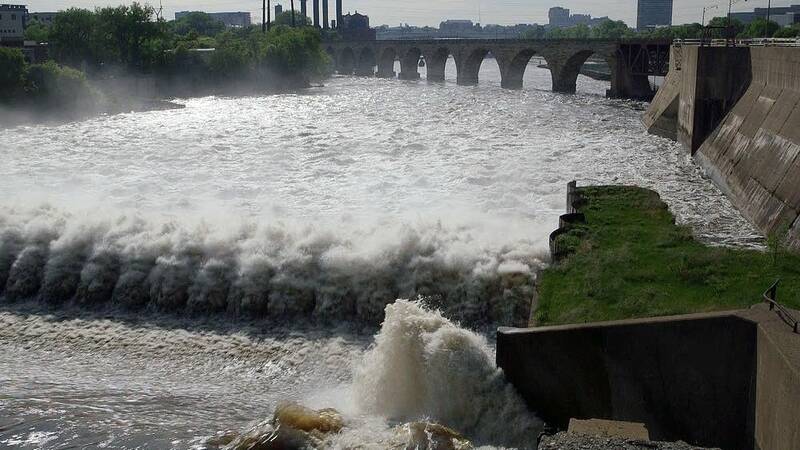 While the act of Congress that called for the lock's closing did not specifically cite a reason, it's widely seen as an attempt to stop invasive carp from gaining access to the upper Mississippi River, above the St. Anthony Falls. U.S. Rep. Keith Ellison, along with Sen. Amy Klobuchar, pushed for the lock's closure in the water legislation. "Closing the little-used St. Anthony Falls Lock is the best way for us to slow the spread of invasive carp in Minnesota and to protect the natural resources that are critical to Minnesota's economy and our way of life," Ellison said in a statement after the bill was passed. It's unclear still if the plan — unique, so far, in the fight against invasives — will work. But the future of the river itself hangs in the balance. St. Anthony Falls is the only waterfall on the Mississippi River's 2,300-plus miles from Lake Itasca to the Gulf of Mexico. Invasive carp have been creeping north up the river since the 1970s — and this unique natural barrier has the potential to finally stop its spread. Closing the upper lock to navigation takes away the possibility of carp hitching a ride above the falls alongside river traffic in the lock. Scientists are most concerned about the bighead carp, one of three types of the invasive fish threatening U.S. water systems. Once they enter a water system, these carp endanger nearly every level of the food chain, displace native species and alter the balance of the waterway's ecosystem. These invasive carp are filter feeders, which means they eat the plankton and tiny creatures — macroinvertebrates — at the very bottom of the food chain. All larval and juvenile fish, such as bass, walleye or pike, depend on those tiny creatures for food and can't compete with the more voracious carp. Without enough food to go around, many of the young fish die — and because larger fish, such as bass and walleye, depend on those smaller fish for food, their numbers begin to dwindle. The situation is even more dire for native species such as paddlefish, whose survival was already under threat from over-fishing and habitat destruction by the time the invasive carp arrived. Once they've established themselves in the food chain, the invasive carp begin to dominate the ecosystem: As they grow quickly and reproduce prodigiously, they physically displace native species from the best parts of the river habitat. They're too big for game fish like bass and walleye to eat, which leaves humans as their only predators. As they force native fish out of their natural habitat, they also force them from their natural spawning grounds. It's an assault from all sides on native fish and the river's ecosystem. 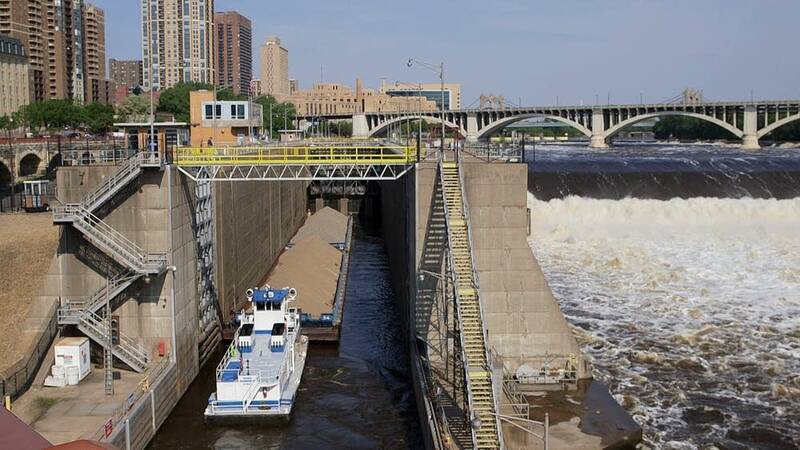 A lock allows boats to move along a river whose water levels change dramatically — for instance, at St. Anthony Falls, where the upper Mississippi sits 49 feet above the bottom of the waterfall — about five stories high. Boats navigate into a small enclosure, about the length of a Minneapolis city block, known as the chamber. The lock then uses a series of gates and doors to raise and lower the chamber's water level to allow the boat to smoothly enter the upper or lower part of the river. The construction of the Upper St. Anthony Lock and Dam follows a deceptively simple design principle: Let the river do the work. While the lock itself is a massive concrete structure that spans, along with the dam it's attached to, 660 feet across the river to Hennepin Island, its large-scale moving parts are minimal, each operated by its own hydraulic ram, each designed with the flow of the river in mind. It typically takes less than 20 minutes for 10 million gallons of river water to fill the chamber. The lock uses the flow of the river itself, as it sprints downstream toward the gulf of Mexico, to raise the level to the upstream waters for boats headed north, and simply opens its drain to lower the level of water for boats headed south. • When a boat needs to move from downstream at the bottom of the falls upstream to the top of the falls, it enters the chamber, the downstream doors are closed and the upstream gates are opened to allow the water of the river to fill the chamber and raise the boat. It typically takes less than 20 minutes for 10 million gallons of river water to fill the chamber. Once the chamber is full, the upstream doors open and the boat continues north on the river. 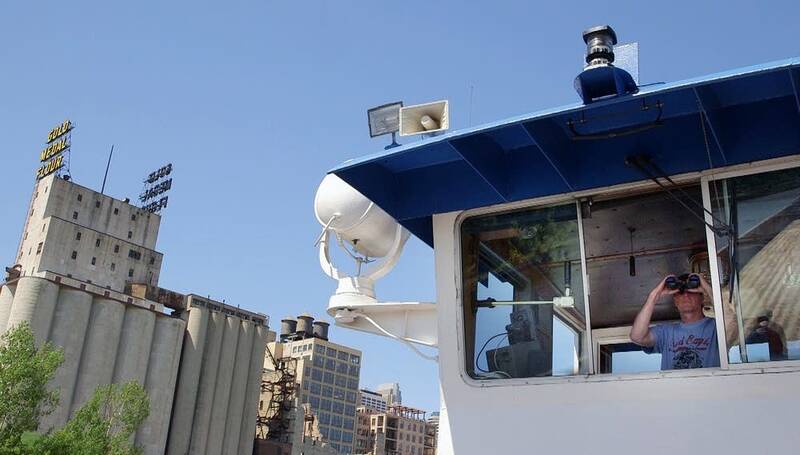 • When a boat needs to move downstream, the opposite happens: It navigates into the chamber, the upper doors are closed behind it, and the lock slowly empties the water from the chamber through the outflow doors. Once the boat is at the same level as the water below the falls, the downstream doors open, and the boat continues on toward the Lower St. Anthony Falls lock, 0.3 miles downstream. The lock has another purpose beyond navigation: If the river begins to flood, the lock's series of doors and gates can be used to relieve some of the pressure of a swelling river and regulate the flow of floodwaters. In the lock's 52 years, it has only been used for flood mitigation six times, most recently in 2014. 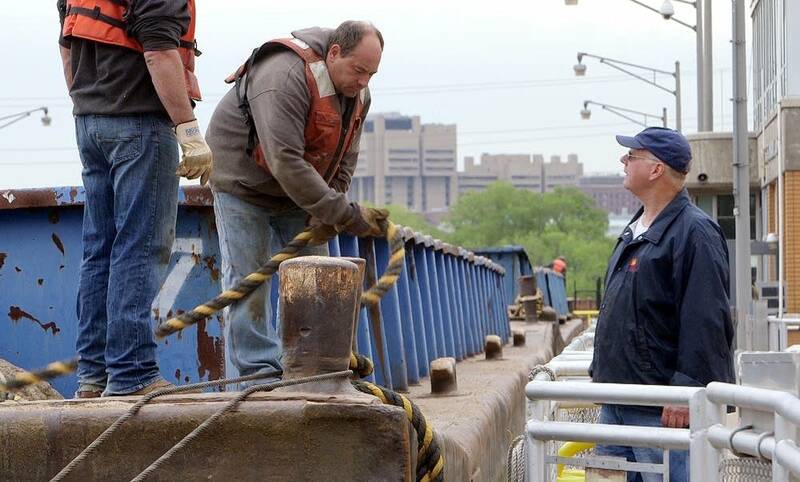 After the lock is closed to navigation this week, the Corps will continue to maintain it, just in case it's needed in a flood. 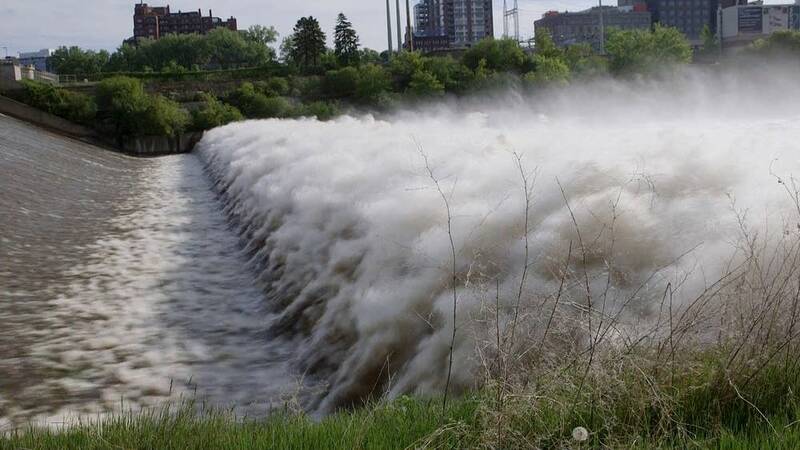 The story of St. Anthony Falls is inextricably tied to the story of Minneapolis, where a city grew up around more than 150 years of attempts — some successful and some disastrous — to harness the only waterfall of the longest river in North America. The falls is a natural barrier — and the only waterfall — along the Mississippi. As travelers stopped to portage up- or downstream, the spot became a natural gathering place. 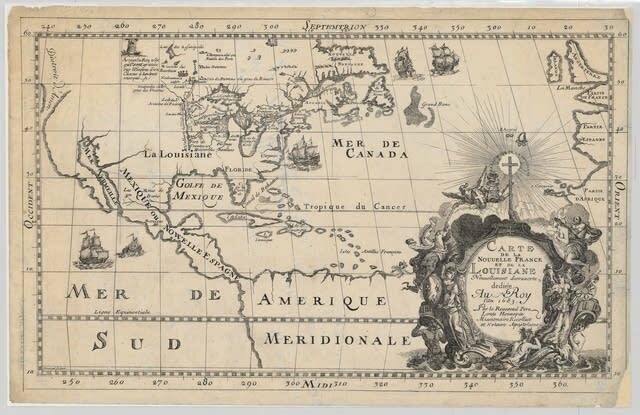 In 1680, the Rev. Louis Hennepin's Mississippi River expedition gave the falls the name it bears today. Stories of the grandeur of the falls, many of which were more than slightly exaggerated, quickly spread — and the St. Anthony Falls became an attraction for early travelers, on through the steamboat era. As more European settlers put down roots on the lands released from the Fort Snelling land reserve in the late 1800s, the communities of St. Anthony and Minneapolis eventually merged, continuing the drive to harness the falls. Col. Josiah Snelling built the first sawmill near the falls in 1821, marking the beginning of the falls' involvement in the lumber industry, which lasted until steam-powered trains freed lumber mills from needing to be located close to the waterfall. 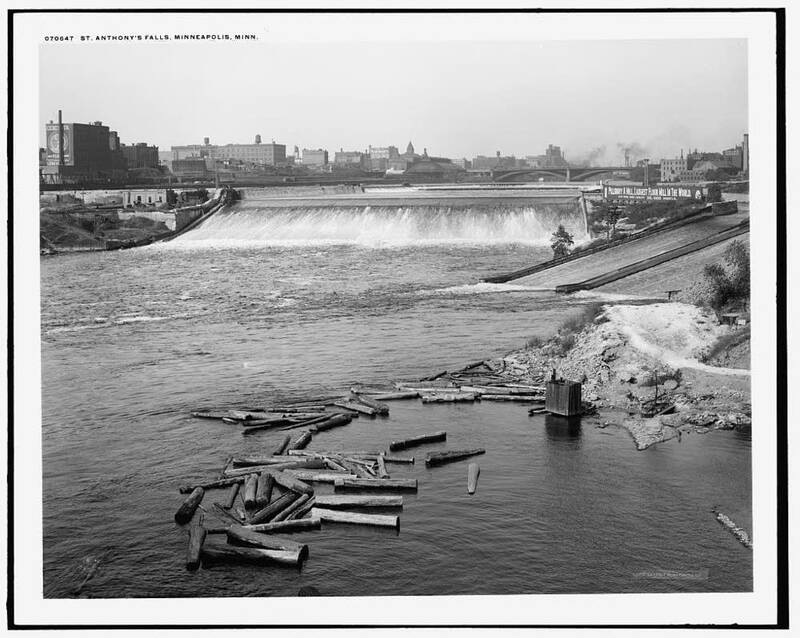 In 1868, entrepreneurs William Eastman and John Merriam commissioned construction of a tunnel that would stretch from Nicollet Island and underneath the falls to serve as a spillway for the lumber companies. A year later, the tunnel, mid-construction, collapsed, causing parts of the riverbed that supported the falls to cave in on itself. 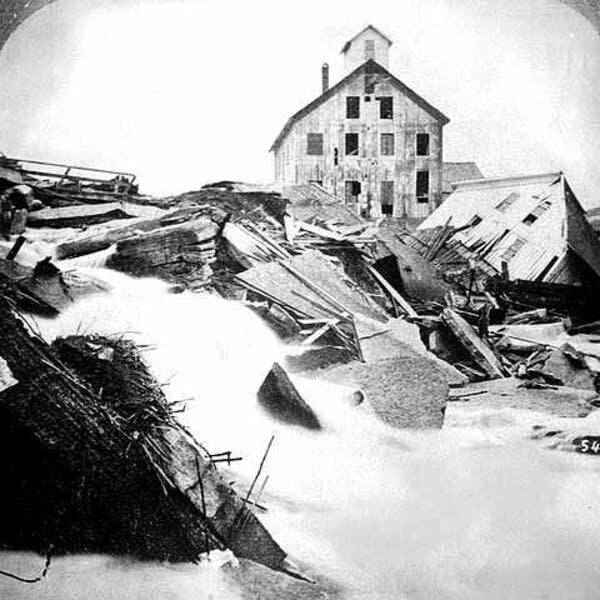 After the tunnel disaster, the relatively young U.S. Army Corps of Engineers was forced to reinforce the falls with construction work between 1874 and 1880, saving the waterfall from collapsing into the river. Some of the Corps' structures are still in place. As timber moved away from the falls in the 1880s, flour mills and hydroelectric power took its place as drivers of Minneapolis industry. 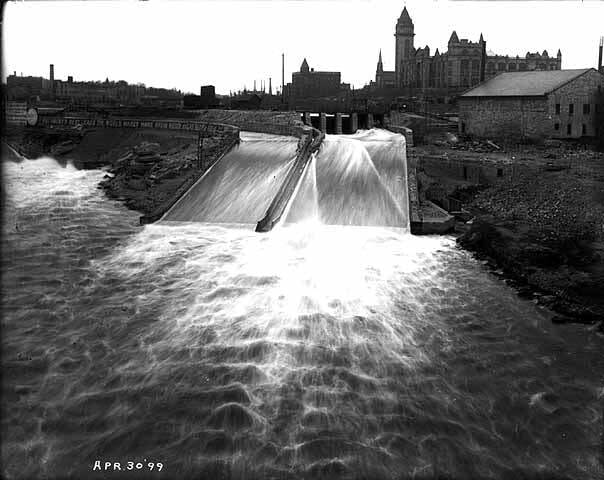 The mills turned from direct water power to steam to hydroelectricity, and the city of Minneapolis followed suit. Between 1907 and 1963, the Mississippi River was transformed by a series of locks, dams and other structures built to enable travel from Minneapolis to the Gulf of Mexico. The Upper St. Anthony Falls locks came late in the falls' history, at a time when the timber and flour mills were already beginning to decline. 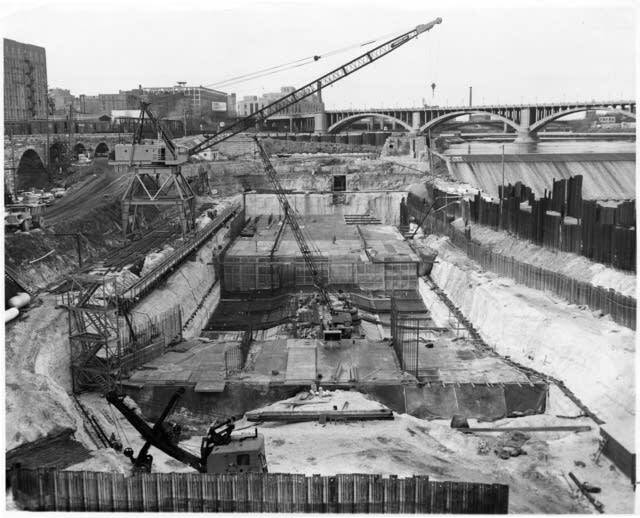 Congress passed the Upper Minneapolis Harbor Development Project in 1937, paving the way for construction of the Upper St. Anthony Falls lock and dam, which was completed in 1963. • The lock will be closed to navigation starting June 10, 2015. • The Army Corps of Engineers will maintain the lock structure so it can be used for flood control. • The commercial traffic that once moved up and down the falls will now travel by truck. • The dredging that the Corps has been doing above the falls for decades will end. 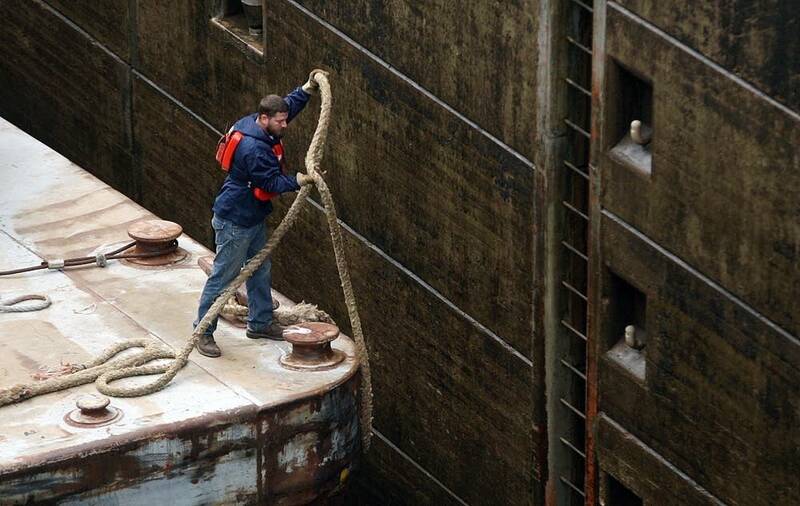 • The Corps will begin a study to determine the lock's future. Still, it's unclear exactly what the long-term effects of the lock's closing will have on the river. "We haven't had an opportunity to rethink the relationship to the Mississippi river since the 1850s, since these cities were really founded," said John Anfinson, who runs the National Park Service's Mississippi River National Recreation Area. "Now we can step back and say, 'Okay, what do we want the relationship to the river to look like for the next hundred years? How are we going to redefine it for the future?' And that conversation is opening just as the doors of the lock are closing. So we are closing one set of doors and opening others, and the ones we are opening are truly exciting." Since the Upper and Lower St. Anthony locks are part of an interconnected system, the upper lock's closing affects the lower lock's functions. 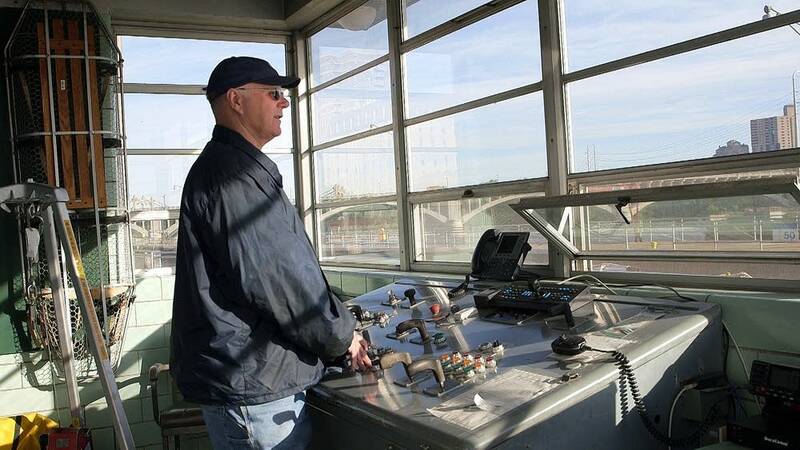 Without any upriver ports, the Lower St. Anthony Lock will reduce its hours after the upper lock closes. Even after the upper lock is closed to navigation, Corps staff will continue to maintain it as they have for more than half a century. 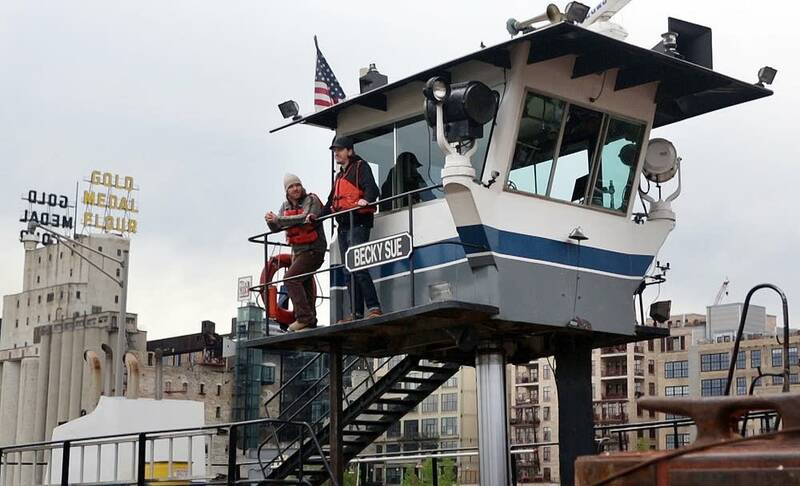 The lock was designed as a full system, so the elements that, until now, have been used for navigation also function for flood control, the only activity allowed at the lock, according to the act of Congress that ordered it closed to navigation. 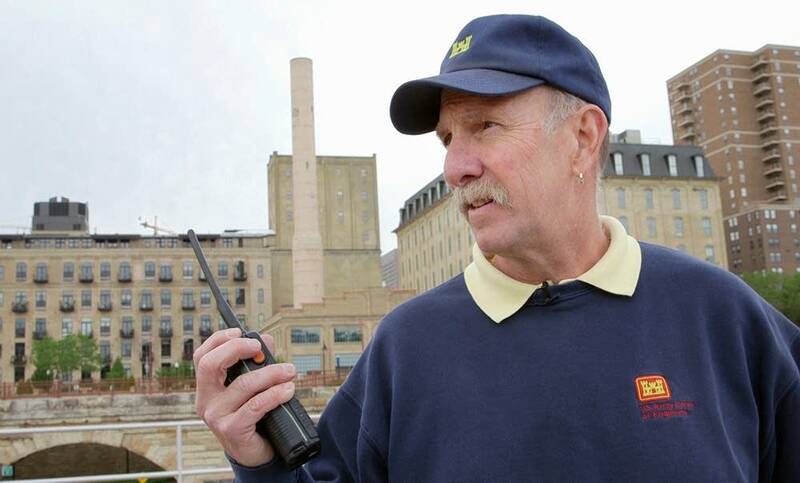 "Look where we are — we're right in the heart of everything," said Mike DeRusha, lockmaster of the upper and lower locks. "So we're going to have to make sure it stays good, because it is one of the city's treasures." For recreational boaters, that could mean a new portage for getting around the lock. That's one option the Corps is exploring for after operations shut down. "Our vision is to go ahead and keep it somewhat operational," DeRusha said, "so people can still see the site, still hear our story." It's likely the lock will be open for tours, too. 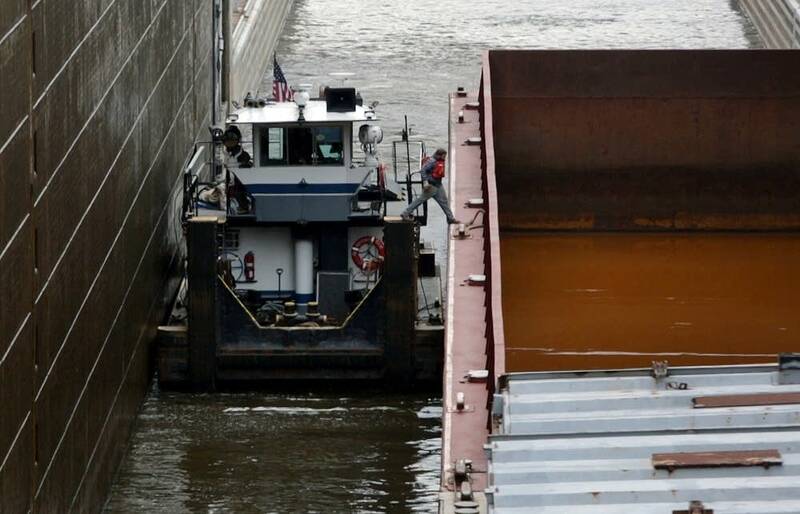 During the lock's last full season of 2014, more than 700,000 tons of freight passed through the lock. The freight that once traveled by barge — each of which carried about 55 to 70 truckloads of material — will now move by truck. According to a Metropolitan Council study, that will add more than 21,000 truck trips to the traffic on local roads. "I think people are going to be awfully surprised when they see the increased number of trucks on the freeway, on 94 between Minneapolis and St. Paul," said Lee Nelson, president of Upper River Services, a river transport company. The Patrick Gannaway was one of just two regular commercial tugboats still using the riverway above the lock before its scheduled closure. Nick Fronhauer, who oversees the invasive fish program for the Minnesota Department of Natural Resources, said that the state's best chance to halt the spread of invasive carp on the Mississippi is to physically stop the fish from swimming above the falls — which means closing the lock. 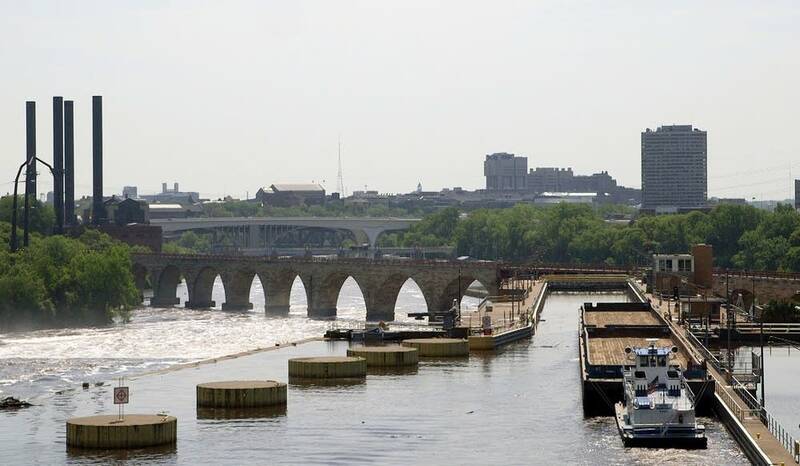 But stopping the invasive fish at St. Anthony Falls will do nothing to prevent it from creeping into other waterways, as the zebra mussel did, leaving the Minnesota and St. Croix rivers vulnerable. And this is the first time such a move has been taken in efforts to quell the spread of invasives. More hydroelectric power might be in the cards for the lock grounds. The energy company Crown Hydro is hoping to build a small hydroelectric plant with two 1.7-megawatt generators on the grounds of the upper lock. As of April 2015, the company had submitted a license application to the Federal Electric Regulatory Commission. The proposal is under review. The end of dredging brings another layer of uncertainty to the river above the falls. Since the 1850s, sediment and debris have been removed from the Mississippi's channels above the falls, a necessity for keeping the waterway navigable and free from too much sediment buildup. When the lock closes to navigation, that practice above the falls will end. No one knows yet how the river will react when the dredging stops. Historical accounts note moments when the upper part of the river was shallow enough to walk across — but the Mississippi has been altered so much since then that no one is certain what the effects might be.